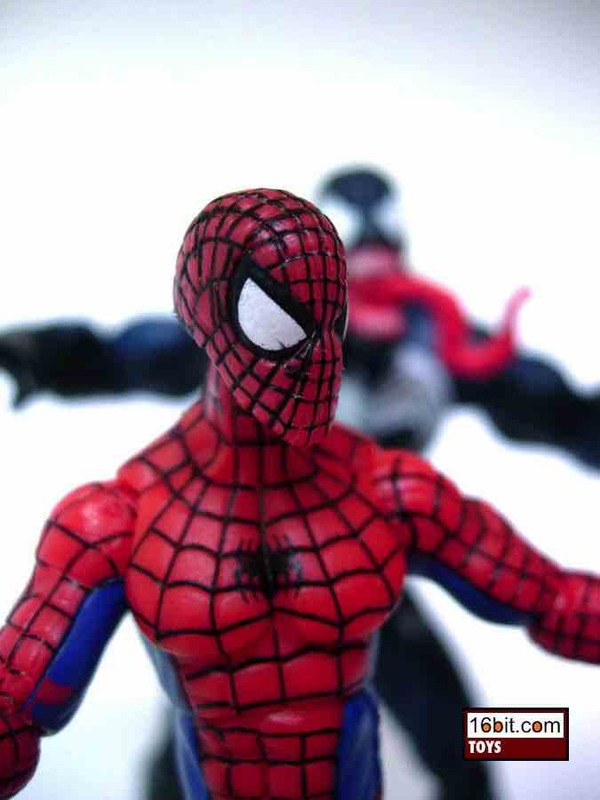 It's worth noting that Hasbro's Marvel Universe Spider-Man figures typically sport about 19 points of articulation, while this-- the best the Hasbro Spider-Man line currently has to offer in the 4-inch scale-- only has 16. 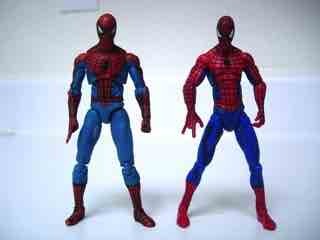 The Marvel Universe version has double knees and two waist joints, with more in common with modern G.I. Joe. 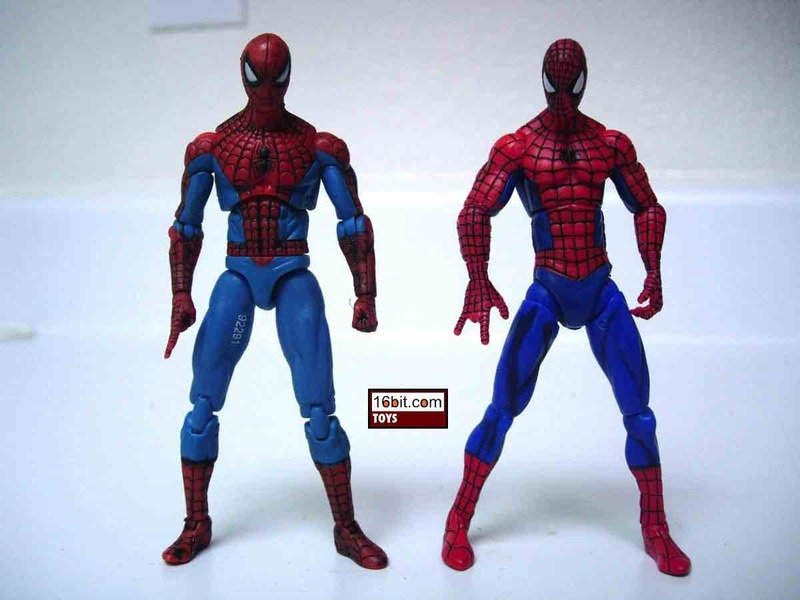 The Spider-Man 4-inch figure line has more in common with Hasbro's Clone Wars toy figures in that figures have less articulation, but tend to look really nice and feel a little more durable than their collector-only counterparts. This figure.shtmlires to be a kid-friendly (but still fun) version of the figure. The sculpt is far superior to Hasbro's other attempts in this size, because he holds together well and doesn't have loose joints, stuck (painted stiff) joints, or loose limbs. 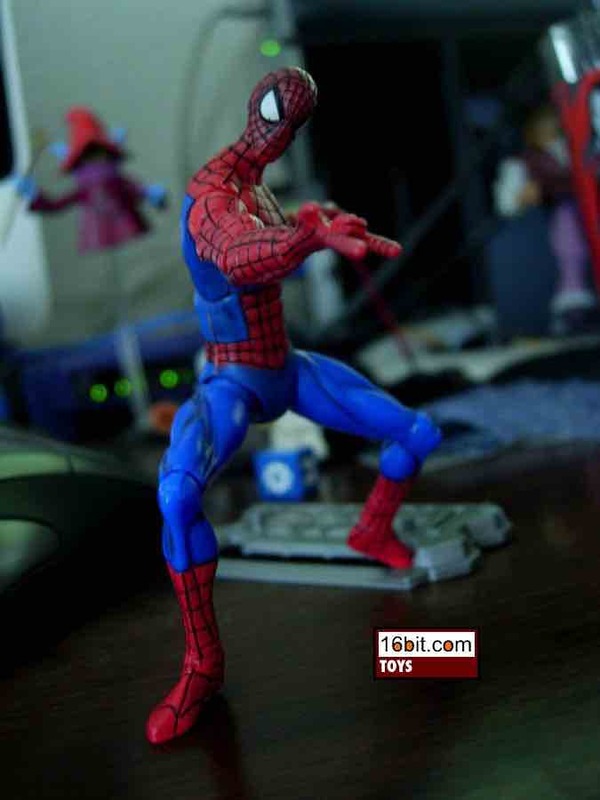 He really does hold together well, most of the other Hasbro Spider-Man toys from Marvel Universe I've had the fortune to play with have had stuck joints or legs that pop off or some other undesirable quirk that may be acceptable in a collector line, but would probably reduce a kid to tears. 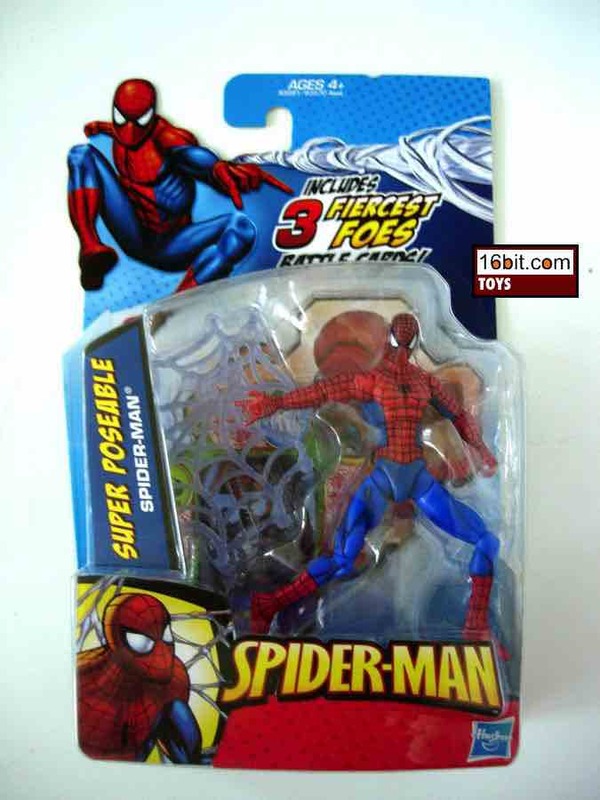 Nobody wants to see Spider-Man ripped apart by accident. Before you poo-poo buying a figure with less articulation, just take a look at him up close-- the sculpt is much cleaner, and the black webbing isn't as haphazard as on other figures. There's very little or no smudging, and Hasbro really did manage to color inside the lines just fine. 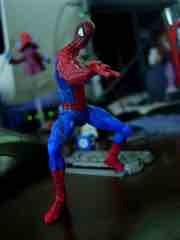 This figure looks better than any other Hasbro Spidey in the scale, but that doesn't mean it's flawless. My sample had a paint chip on his right arm, and I didn't notice this until after I brought him home. Even with the chip on his arm, the figure still looks better than his counterparts. The only place he suffers slightly is in his hip joints, which are these strange double-hips which are actually a little difficult to fidget with and get in an agreeable position. On all of Hasbro's figure lines, it seems the hips are one area that they seem to be having more and more complications getting in the way of play. 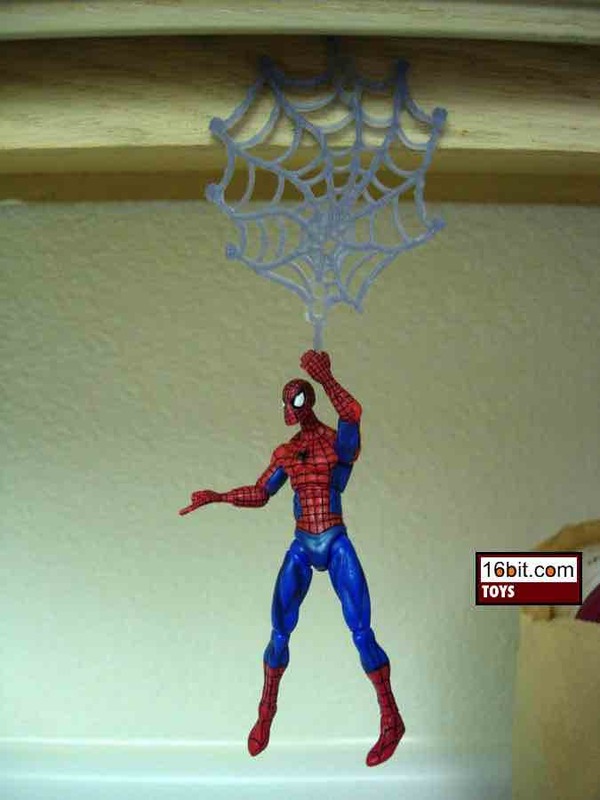 He includes a web accessory that is designed to connect to other web accessories. For example, it has a tab and some holes on it, and you could plug it in to the Green Goblin's glider or Venom's web axe. It's an interesting gimmick but as of yet, it's less a real value-add and it feels like something they threw in just to justify the seemingly higher price of this particular figure line. How could Hasbro make this figure any better? Magnets. 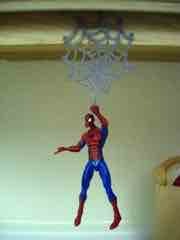 Spider-Man would love to hang out on the fridge, I'm tellin' ya. Failing that, you could just buy any of the dozens of Spider-variants which include ninjas, extreme arctic sports, and hang gliders. 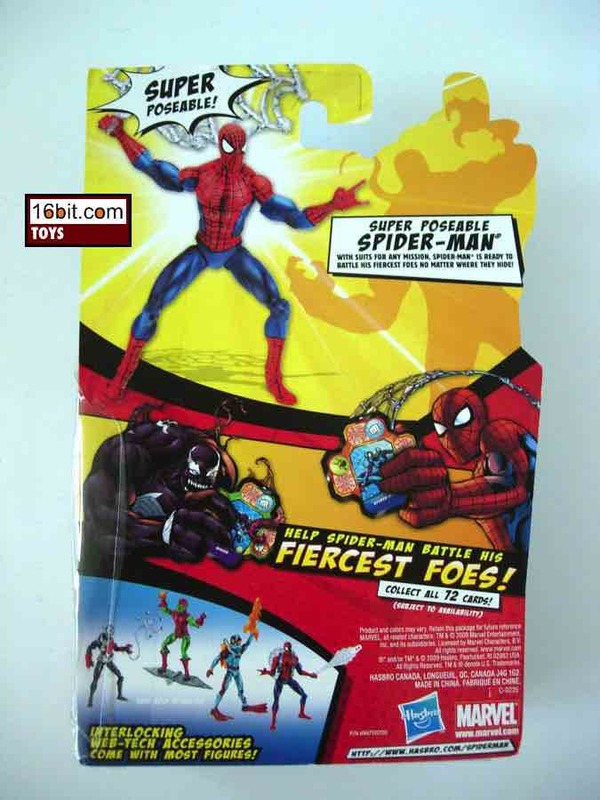 What's unusual here is that Hasbro has been slowly embracing a different design philosophy for their packaging, specifically upsells. You can see that on the back of the package, only about 15% of the space is devoted to selling you other figures. Roughly 50% is there to showcase the figure in your hand, 35% (or so) focuses on an in-pack card game which I've so far completely ignored and legalese. 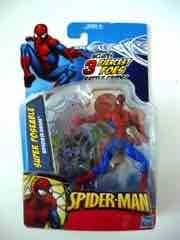 Back when I was younger, toy companies would show off dozens of figures using the back as a catalog. This could work against the product, showing kids what other figures they should wait for instead of buying what's in front of them right now. 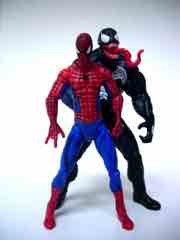 It's a notable direction, and one Hasbro seems to be taking in all of its male action toy lines these days.